Gilborn's writing is at once eloquent, realistic and always insightful about the region's unique character. The collection includes two fine essays on the life and writing of Jeanne Robert Foster, who was close friends with some of the major writers and artists of the 20th century. 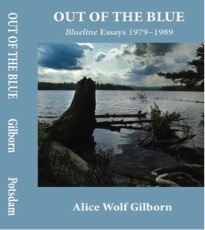 Gilborn's passion for nature writing in also clear in her reflections on Nathaniel Hawthorne, Ralph Waldo Emerson and Henry David Thoreau, as well as their intellectual descendent, Leo Marx. His writing on "the machine in the American garden" informs Gilborn's title essay about flyovers of military jets, which use the Adirondacks as a testing ground. In other essays, Gilborn pokes fun at her own perceptions, along with all those who, like herself, are ultimately visitors to this spectacular country. Soon after my family and I moved to Blue Mountain Lake in 1972, we noticed an old man walking along the road each day, so bent in the back that he appeared to be examining his shoes. Yet he moved as if his eyes were fixed on the horizon, his firm, unflagging stride carrying him every morning up the hill to Long Lake or down the road toward Old Forge. Hat crushed on his brow, stick thrust forward, he traveled indifferent to all weather, through fog, dust and black flies. When it rained, draped in a hooded poncho that emphasized his nose, he looked like a huge, earthbound bird. He rarely joined the backpackers in the woods but kept to the side of the road. Once when I was riding my horse I surprised him, and he glanced up with eyes as clear as blue glass and laughed, reaching toward my startled animal with a long, boney hand. No one in town knew much about him, only that he was from an eastern European country, spoke little English and spent his summers trekking in and out of Blue Mountain Lake. We called him the walking man. The appearance of the walking man marked the beginning of the season for me. One year, however, he did not arrive until July and limited his excursions to the area around the village. I was writing articles for the county newspaper, and it occurred to me the walking man would make a good subject for a story. I spotted him heading down Blue Mountain hill toward the cottage he was renting, so stooped that his head almost grazed his knees. He was moving slower than usual; I pulled my car to the side of the road and leaped out, stationing myself directly in his path. In a loud voice I announced my name, hoping he'd recognize me as the rider of the horse. The walking man looked up with keen and startled eyes but didn't stop. I found myself backing awkwardly down the road mumbling something about wanting to interview him for the paper while he made abrupt, futile attempts to skirt around me. "No, no," he protested, shaking his head, "don't understand." I realized I was frightening him, and suddenly embarrassed, I stepped aside and watched him retreat to the safety of his cottage. I knew it was useless to press him for information. When he failed to return the next summer, I guessed that he had died. In the absence of fact, the walking man continues to tease my imagination. For me he represents design, mysterious and transient, in the midst of prolific, unruly nature. This hunched and solitary figure, a stranger from a foreign land, touched for a brief time the wilderness he patterned in his own way. Not a true wilderness, of course; the Adirondacks has been altered and restrained by the hand of man since the first settlements began to appear some two hundred years ago. Its forests and mountains have been crossed by poets and historians as well as hunters and lumbermen; still, the dramatic possibilities inherent in the Adirondacks have not been fully realized by a writer. Many have come as summer visitors in clement weather, passengers upon the landscape, airing their impressions. Some have posed as local colorists, perpetuators of folklore and its idiom. Literary expression has been, at the best, halting; romantic or sentimental rather than realistic, often taking form of simple celebration. But the country is not an easy one. Those who live within its boundaries know the tranquil lake gleaming in a lavender sunset in six months will be a wind whipped field of ice. There's little to praise when the temperature drops to thirty below. People huddle together and minds turn inward. In all its beauty there is harshness; in the overwhelming simplicity of this natural world lies the cruelty and complexity of survival. Here is fodder for the imagination, fertile ground for poetry and prose. Requisite for all writers, whatever their predilection, is a vehicle for their words. Blueline is a small beginning with a large hope—to provide such a vehicle. In spite of his reticence, the walking man conveyed something important: he carried mystery upon his shoulders just as the mountains carry mystery upon theirs. The task of any writer, whether he writes of men or mountains or both, is not only to reflect the surrounding world, but to discover the inarticulate truth of the imagination. The walking man moves through these pages.